There seem’d–and then no more of THEE and ME. ‘Throwback Thursday’ to this illustration for Quatrain XXXII of Rubaiyát of Omar Khayyám, published by The Folio Society, 2009. 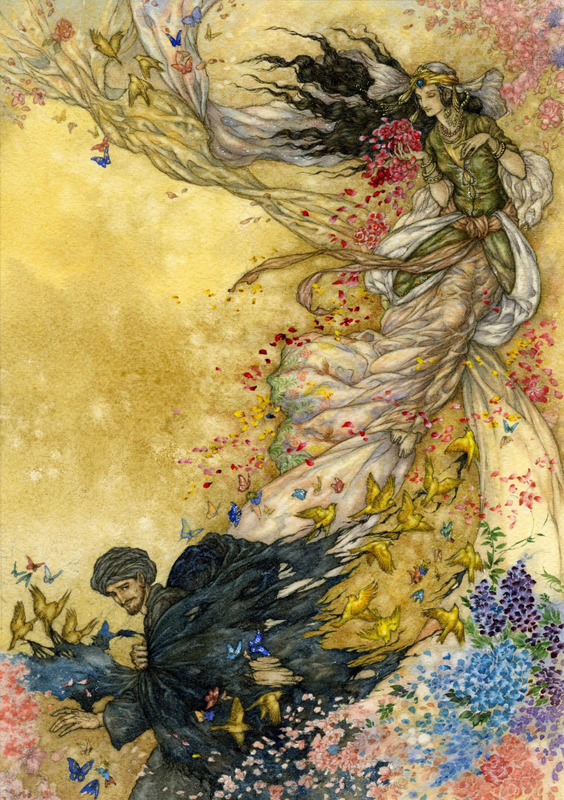 This piece borrows directly from Rene Bull’s illustration to the same quatrain from 1913.
lllustration to Quatrain 70 for the 150th anniversary edition of Edward FitzGerald’s translation of Rubáiyát of Omar Khayyám, published by The Folio Society, in a limited edition of 1,000 copies, 2011. Watercolour and gouache on Arches cold pressed watercolour paper, 280 x 200mm. I swore – but was I sober when I swore? Happy Vernal Equinox! I’m off to Paris tomorrow for three days with a few friends to welcome the spring! 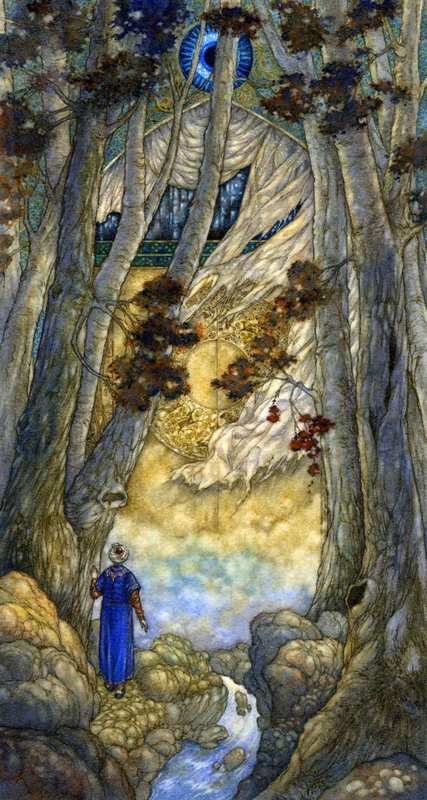 Illustration to Quatrain VII, sesquicentenary edition of Rubáiyát of Omar Khayyám, published by The Folio Society, 2011. Watercolour and gouache on Arches hot pressed, 240 x 135mm. To fly – and Lo! the Bird is on the Wing. I’m having a slightly stressful and fretful period. Among other things, I’m packing in preparation for moving, going through my horrendous mountains of things little by little. Like everyone else in the northern hemisphere, I am longing for spring and a fresh new beginning. As with the illustration to quatrain IX, I also drew from Persian mythology for this; this time choosing the Huma bird as the subject. It is a creature of fortune who bestows kingship and flies without ever coming to rest. 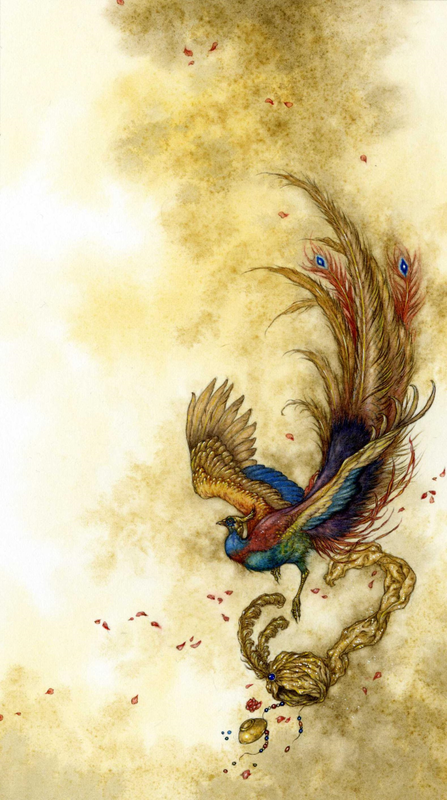 In some variations of its legends, it is said, like the phoenix, to consume itself in flames and rise again. I felt that it might serve for the metaphorical ‘Bird of Time’ of the quatrain. I keep meaning to create galleries for some of my books but still haven’t managed to do so. For now, I thought I might share this older piece from the Rubáiyát to keep the theme of the Year of the Horse going. Watercolour with touches of gouache on (old) Fabriano Artistico watercolour paper, 280 x 200mm. 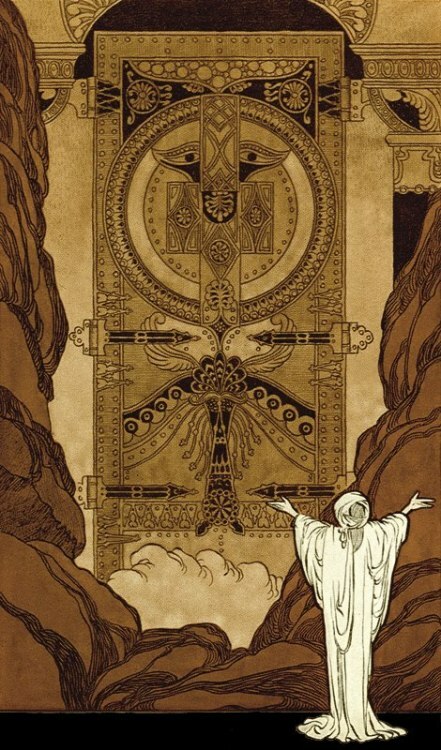 lllustration for the 150th anniversary edition of Edward FitzGerald’s translation of the Rubáiyát of Omar Khayyám, published by The Folio Society, 2009 (edition sold out*). I ‘cheated’ a little with this quatrain: this piece properly illustrates only the third line, rather than interprets the sense of the quatrain as a whole. 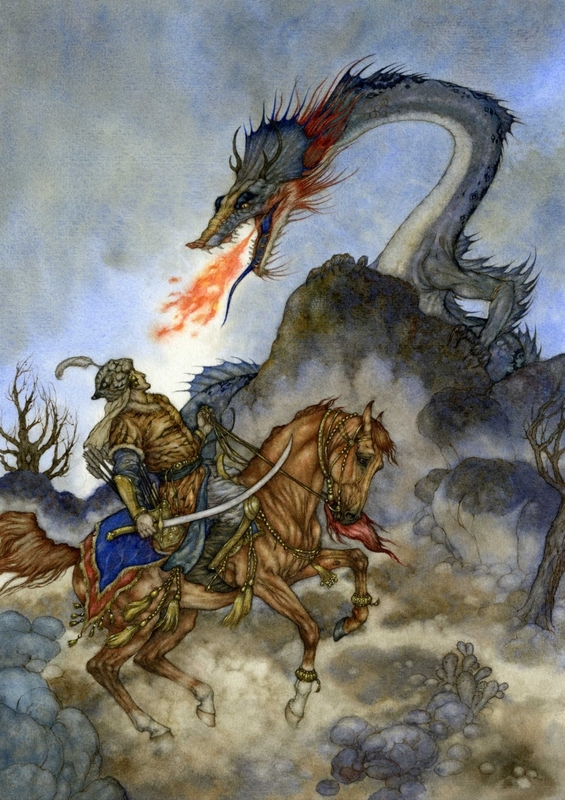 But it gave me the chance to depict an episode of the Shahnameh in which Rustam (a kind of Persian ‘Hercules’, if you will) and his horse, Rakhsh, fight the dragon. *The Folio Society has released a smaller, less costly new edition reproducing all the illustrations without the original binding or the limited edition etching.